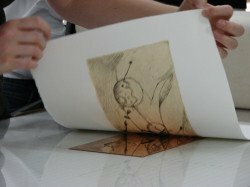 Zea Mays Printmaking provides hand-pulled editioning services to Artists and Publishers of fine art prints. We also offer plate production for artists who wish to make their own editions. Our contract printing and editioning services are unique in that we cater to artists and publishers who are interested in creating prints in ways that are non-toxic for the printers and the environment while maintaining the highest aesthetic standards. Please contact liz@zeamaysprintmaking.com for details and pricing. combining all of the above, plus the marriage of digital and hand-pulled prints.